It's the last call for Lens to prepare Stade Bollaert-Delelis for Euro 2016. Before the tournament the ground will receive a new roof structure. Previously installed roof required numerous pillars between fans at all stands, while the new one is to have tall pylons supporting it from the outside, allowing to eliminate obstructed view seats. As the cover is expanded, new wider seats are also expected, especially in the corporate sections. Together with enhanced disabled spectator facilities the stadium is planned to lose some 6,000 of its capacity. 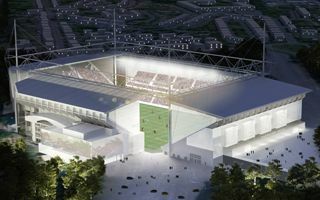 Initially the plan by Pierre Ferret was supposed to cost under €50 million, but was later estimated to consume €70 million.